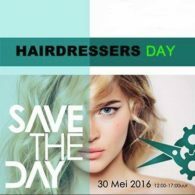 May 30th, Hairdressers day in The Netherlands! Four inspiring shows, demos and a fair where several companies give you the information on the latest news in the hairdressing sector. The exhibition is filled with various barber tools, trendy products, workshops, demos, test equipment, entrepreneurial vision, in short ... SHOP TILL YOU DROP !!! !